Designers in China are no longer copying the west as a new generation of home-grown talents emerges, according to Lyndon Neri and Rossana Hu of Shanghai studio Neri&Hu. Awareness of design among Chinese consumers is changing at "super speed", say the duo, while the government is encouraging the creative sector to develop original ideas rather than copying the west. "The design scene in Shanghai is changing, extremely fast," Hu told Dezeen. "Like, super speed. Ten years ago people didn't really understand modern design, nor did they appreciate it." Today things are changing, she said. "Customers are learning really fast, and the market is shifting, and now people are seeking out things that have individual characteristics," said Hu, adding that there was now a "real hunger and thirst for knowledge" about contemporary design. The shift comes at a time when the Chinese government is actively encouraging industry to be more creative and less reliant on overseas ideas. In 2015, Chinese president Xi Jinping announced his Made in China 2025 initiative, which aims to repurpose the country as a global power in design and innovation. "Xi Jinping has called on Chinese companies to produce things that are really strong and unique, that are truly from China," said Neri. "There is support from the government to be creative so that we are not seen as a country that just copies things any more." "I think a lot of European consumers think about Chinese design as being about copying, and not an original location for creative production," said Hu, adding that she hoped western consumers would soon be buying Chinese-designed products. "Now we're hoping that the tables have turned and that they can see original and quality products that combine both craft and industry together," she continued. According to the duo, this is encouraging a new generation of Chinese designers who are pioneering home-grown ideas rather than adopting them from overseas. "It started off with China looking at the west and seeing it as a role model," said Neri. "But now we're starting to see a lot of freshness within the next generation." Like many of their contemporaries, Neri and Hu were educated in the west. They met while studying architecture at the University of California in Berkeley, USA, before returning to Shanghai to set up their studio in 2004. The new generation of Chinese design talent, however, is learning its skills at home. "Many more are educated in the west, and they take what they learn and they try to develop their own language," said Neri. "But there are a lot of designers who are not educated in the west, and who have never even been to the west, who are now developing their own language." 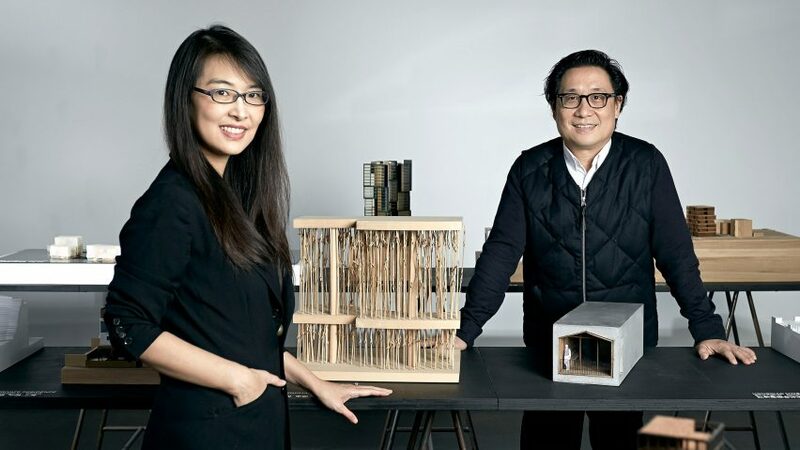 This marks a dramatic change from six years ago when, in a previous interview with Dezeen, the duo commented on "the absence of a modern Chinese architecture and design language," claiming that "architects feel lost." Neri and Hu ranked at number 33 on Dezeen Hot List 2017. The pair spoke to Dezeen at the Poltrona Frau showroom during Milan design week earlier this year, where they were launching a new range of lights for the Italian brand. Besides their design studio, the pair run a thriving architecture practice with projects around the globe, and are creative directors of furniture brand Stellar Works, which also debuted new products at Milan design week. Neri and Hu also established Design Republic, a retail store and online platform. It offers Chinese consumers a diverse range of products by esteemed global designers, which have never before been made available to them. Today, China's growing economic power and confidence means that Chinese creatives have more freedom to explore ideas that would once have been discouraged, said Neri. This is leading to a greater interest in design with a social conscience. "When you're under stress, when you're under political or financial constraint, when you're poor, when you have to feed a family, then you don't really have time to say 'what can I do to give back? '” he said. "But when you don't have to worry about the economic pressure, or the political pressure for that matter, then people aspire to leave a legacy and create things that will hopefully be able to contribute to society," he continued. "So it's an interesting moment in time for China, because you can see that, financially, it is getting stronger."